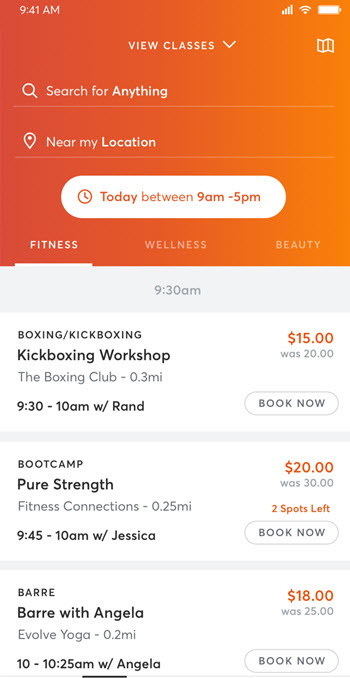 How do I find a business outside of my current location on the MINDBODY app? You can easily search different areas, addresses, and find businesses over 25 miles from your current location. Is your favorite studio, gym, or salon more than 50 miles away? Are you planning an upcoming getaway or quick business trip and want to check out the MINDBODY® businesses in the area? No matter where you are or where you are going, the MINDBODY app gives you access to a global network of MINDBODY businesses right at your fingertips. Just enter the name of the city, postal code, or street address where you're going to be, and the MINDBODY app will search the area without using your phone's location services. To get started, tap the search icon at the top left of the Home screen, or the Explore icon at the bottom. Tap Near My Location to enter a custom location. Enter a city, postal code, or address to search that area. You can refine your search results further by entering a business name, keyword, or service type. Not quite familiar with the area you're in? Tapping the Map in the top right corner will show you all the businesses in your surrounding area.